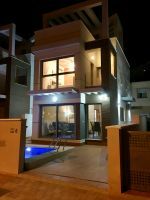 Description: This lovely duplex style holiday home is ideally located for family vacations, with easy access to the beach and all amenities. The house is in the El Alamillo area of Puerto de Mazarrón, a short walk from a supermarket, bars, and restaurants. The accomodation comprises: tiled area to front of property with space for off road parking. Front door leads into the open plan living area, with compact, fully equipped kitchen to one side and shower room / utility room to the other side. The kitchen has a dishwasher, fridge freezer, microwave,kettle, toaster, juicer ,blender and coffee maker plus plenty of crockery and cutlery, pots and pans, plus a breakfast bar and stools. The open plan living room has a dining area with table and chairs to one side, and a large comfortable "chaise" style sofa with adjustable back rest in front of the TV / Bluray player & free internet access, ideal for relaxing after a hard day at the beach. From the living area, sliding doors lead to the terrace where you will find a pergola to offer shade and a dining table and chairs for eating outdoors and enjoying the views across the bay. Stairs lead up to the 3 bedrooms, 2 twin rooms and a double master bedroom. All bedrooms have wardrobes and storage space. There is a further full family bathroom on this floor. The property has airconditioning throughout ( also with heating mode), with a system for the bedrooms and a separate unit for the downstairs living area. To complex has a communal pool just 20m away, which is secure and for residents of the complex only. To the side of the property is a gated spiral staircase leading to a viewing terrace with 360 degreee views of the sea, mountains and the countryside beyond. This upper solarium is unfurnished. Guests may use the terrace at their own risk, but the gate should be kept securely locked in the presence of children. The local area has a small supermarket, bars, restaurants and a pharmacy, whilst the larger shopping complex and the centre of Puerto de Mazarrón are just a few minutes drive away. The promenade or paseo is approximately a 10 minute walk, as is the closest beach. Kids will enjoy the long beaches, some with inflatable "aqua playforts" in summer, and water sports such as jetski, kayaking, diving and sailing are available locally. There is a tourist train in high season, and a glass bottomed boat offering trips around the coastline. And with the larger cities and shopping centres of Cartagena and Murcia within 45 minutes drive, there is something to do for every member of the family. Smoking outside on terrace only, pets not permitted in this property. This property is one of 2 linked duplexes. The properties are identical but mirror images of each other. They can also be rented together for extended families or larger parties, sleeping 12 in total. See our separate listing under ref. AL01 + AL02, 6 bedroom duplex. keyholder / clean & laundry fee of 90 euros for local services, which will be added at the time of booking. This listing has been viewed 3151 times.